English- and French-language Baedeker editions on Benelux. See also editions in German. 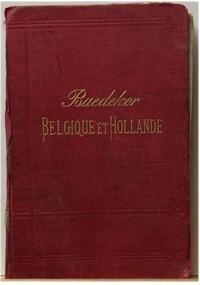 With their well-developed railway networks, the states of the Netherlands and Belgium were first-class Baedeker territory. Luxembourg was united with the Netherlands (the king of the Netherlands was also Grand Duke of Luxembourg) until 1890, when (due to a difference of opinion over female succession) it chose its own Grand Duke and became fully independent. It is around that time the Baedeker editions start referring to Luxembourg separately in the full title.